Taipei, March 19 (CNA) Kung Chao-sheng (龔照勝), former chairman of Taiwan's Financial Supervisory Commission (FSC), died of a heart attack Friday night at age of 61. Kung suffered a myocardial infarction and fell into a coma when he was at a dinner gathering with friends. Emergency treatment by a doctor who happened to be in the same restaurant failed to save his life. Kung chaired the FSC, the top financial regulator in Taiwan, from 2004 to 2006 under the then President Chen Shiu-bian (陳水扁) from the Democratic Progressive Party (DPP). Kuomintang lawmaker Tseng Ming-chung (曾銘宗), which used to head the FSC before becoming a legislator in February, said he was stunned by Kung's death. He said Kung had appeared in good shape and had been very active in outdoor activities, such as mountain climbing. Tseng added that Kung was an easy going person. As the first chairman of the FSC, Kung made tremendous contributions to the commission, Tseng said. Kung played a critical role in setting up a monitoring system for the local financial market since he had a thorough understanding about the international financial markets, according to Tseng. Kung used to work for foreign banks operating in Taiwan, such as Credit Suisse First Boston. Tseng said that Kung's fluent English and rich working experience in the foreign banking circle made him very capable of heading the FSC. During his term as the FSC chairman, Kung repeatedly led delegations overseas, helping Taiwanese financial institutions explore the foreign markets, Tseng said, adding that Kung's presence had boosted the global visibility for Taiwan's capital market. The FSC was inaugurated in July 2004 and has taken responsibility of supervising banking, securities and insurance markets in Taiwan. 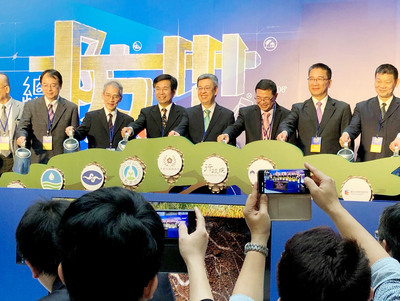 Tseng said that as the head of the FSC, Kung always listened to the opinions expressed by local financial firms and during his tenure, Taiwan's financial market remained stable. Echoing Tseng's lament over Kung's death, Huang Tien-mu (黃天牧), the incumbent vice chairman of the FSC, said that Kung was a good boss who took good care of his colleagues in the commission and was respected by his subordinates. In 2006, Kung was charged by prosecutors for alleged involvement in three corruption scandals which arose when he served as the chairman of state-owned Taiwan Sugar (台糖) in 2003. He was later acquitted but was nevertheless impeached by the Control Yuan, a branch of government responsible for ensuring ethical conduct on the part of officials.